Aconitum Napellus also known as Monkshood, aconite, Wolf's Bane, Monk's Blood, or Monk's Hood is a species native to western and central Europe and northeastern United States. Aconitum Napellus has found its place in mythological history. As wolfsbane, it was believed to repel the werewolf and protect anyone who wore it from the wolf's attack. Like other species in the genus, Aconitum contains several poisonous compounds, including enough cardiac poison that it was used on spears and arrows for hunting and battle in ancient times. Aconitum has a long history of use as a poison. During the ancient Roman period of European history the plant was often used to eliminate criminals and enemies, Later the Roman government made the use of the herb illegal and punished citizens who grew it. Aconitum produced from the roots of a number of different species of Aconitum is used in Traditional Chinese Medicine to treat "coldness", general debility, and "Yang deficiency." Misuse of the medicinal ingredients contained in this plant can negatively affect the cardiovascular and central nervous systems, thus resulting in death. Homeopathy dilutes aconite so that it is not poisonous. These medicines are typically diluted in alcohol and water. After the dilutions, there is hardly in poison left in most of the medicine. Aconite's primary usage in homeopathy is as a fever reducer and treatment of flu and pneumonia. This medicine has a cooling effect on body which helps to relieve conditions such as fevers and colds. 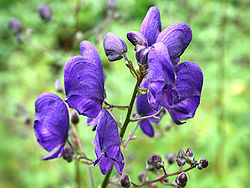 Aconitum is also used as an homeopathic ointment to the skin that will create a pain-relieving numbing sensation. It is used for treating joint pains from rheumatism, lumbago and neuralgia. This remedy is also used to treat nervousness, emotional trauma, fear and anxiety since it helps calm down people. Aconitum has been transformed from a medieval poison to a modern medicine that helps to treat a wide range of ailments.